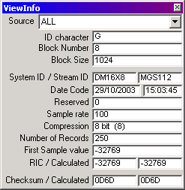 Every incoming block is decoded and the header information is displayed in this window. The user can select 'ALL' sources to view, or select a specific data source from the drop-down list. As scream receives data from new sources, they are added to the list. A number of checks for validity are made, and any fields which appear invalid are shown in red. The program will still attempt to use the data in the block, however, unless either the compression code or the checksum is invalid. In the case of an invalid checksum, the transfer protocol should �Nack� the block, and force a re-transmit of the corrupt block. If the communications link is simplex, however, this will not occur, and the data block will be lost. Block Number An incrementing counter, modulo 256. (i.e. 255 + 1 = 0). A separate count is maintained for each data source. If "ALL" sources is selected, then this value may not appear sequential, as each source has a separate sequence. Unless the field turns red, the sequence is correct. Block Size The size, in bytes, of the GCF block following. This does NOT include transport information. [GCF block header] See GCF Block Specification for more information on the meaning of these fields. RIC / Calculated The RIC is the Reverse Integrating Constant. This is the value of the last sample in the block. The two numbers shown reflect the value read from the block, and the value calculated from the samples within the data. These two numbers are compared, and if not the same, a compression or decompression error has occurred. Checksum / Calculated The first number is the checksum value that has been received, and the second is the value calculated from the rest of the received data. This is a sum of all bytes in the block (including header, but excluding itself), modulo 65536. These two numbers are compared, and if not the same, a communications error has occurred, and the block should be considered void. A log of all detected errors is available. To enable logging, select the �record block error log� option in the Error Logging Options Page. Logging of individual error conditions can then be controlled by selecting or clearing the options within this item.